Visit us at the TUEV NORD booth of the HANNOVER MESSE. The contact inspection drone developped by the AEROARMS consortium, to which SENSIMA belongs, will be presented for the first time to the public. This drone offers new perspectives for remotely controlled inspections, introducing contact inspections methods such as Eddy Current and Ultrasound in the drone industry. This drone benefits from the unique inspection technologies and integration engineering of Sensima. . 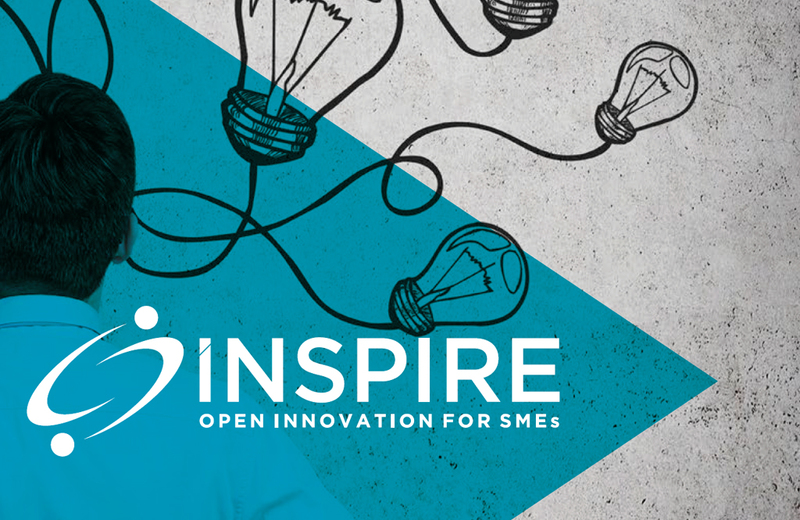 The business model of Sensima and its spin offs has attracted the attention of INSPIRE, a coordination action funded by the European Commission (Horizon 2020) which seeks to pool knowledge, expertise, and interest around Open Innovation in SMEs with the aim to professionalize Open Innovation (OI) processes in European SMEs. In this frame, Sensima has been selected as a good practice case from around 120 practices identified around Europe. Sensima and AIMsight were invited by the UAE section of the American Society of Non Destructive testing to present the latest developments of the eddy current techniques, with a particular focus on the permanent monitoring of cracks in O&G structures. A good opportunity to exchange with practioners working at the "front line" of the asset integrity of O&G assets. Sensima and AIMsight are looking forward to meeting again with this community at the occasion of the GNDT, The Gulf Nondestructive Testing Expo in Dubai, September 25-27, 2018. Sensima, inspire and HEPIA completed a project aimed at improving quality management in additive manufacturing industry in view of its application to space industry. The results of the project have been presented today at EPFL at the occasion of the presentation of the results of the Swiss Space Technologies Studies. The poster of the presentation is available here. The time has come to highlight our main achievements after one year of operations in the structural health monitoring: Launch of new products combining compliance with NDT standards and most advanced data processing technologies, 7 infrastructures instrumented, one product approved by the American Bureau of Shipping, underwater monitoring solutions ready to fly, all in all a great year for remote NDT ! Sensima is proud to announce the foundation of its next spin-off that will take over and expand the activities of Sensima in the field of Condition Based Maintenance (CBM). The new company will further develop Sensima's CBM products to take them to the level of digital Asset Integrity Management (AIM) solutions, therefore offering industrial customers a global solution for root cause monitoring and decision support. This will allow Sensima to focus on the NDT market and to continue helping its customers with passion, as it has done in the past, with state-of-the-art solutions, service, and equipment dedicated to the needs of the traditional NDT industry. The new monitoring products will differentiate from competition by the high level of reliability of the data generated by normalized NDT blocks and components. They will be powered by the high-end and renowned NDT technology of Sensima. These products will allow the maintenance industry to join the IoT revolution and move to the "Industry 4.0" level and will address the need for the volume and variety of data, beyond their veracity. A strong commercial partnership between Sensima's new spin-off and SGS, the world's leading inspection, verification, testing, and certification company, has been set up. This answers the market demand for third party suppliers with a strong commitment on the veracity of the data and opens a global actor's network to the new entity. 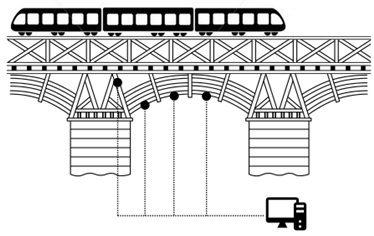 The primary business focus of the partnership is the structural health monitoring, in particular bridges and cranes. Sensima is proud to announce the commisionning of a monitoring system aimed at monitoring cracks in a penstock of a >100MW Swiss hydroelectric power station. The project, which is the result of a collaboration between Sensima, Hydro Exploitation, and ALPIQ, with the support of The Ark, was presented recently at a Technical Workshop of the Institut de Soudure in Paris. The slides (in french) are available here. While drone based non contact inspection (optical, 3D stereoscopy, IR, lidar,...) is moving quickly to a commodity business, huge efforts are still to be made in the aerial robotics and NDT measurement technology to access contact NDT (i.e. Ultrasound, Eddy Current). Significant steps into that direction are made in the frame of the AEROARMS collaboration supported by the H2020 programme as demonstrated in the video above (in french). Sensima Inspection teams up with the major organisations in Europe developping advanced aerial robotics in the frame of the H2020 project AEROARMS. The objective of the project is to develop breakthrough industrial inspection solutions integrating the most recent robotics technologies. 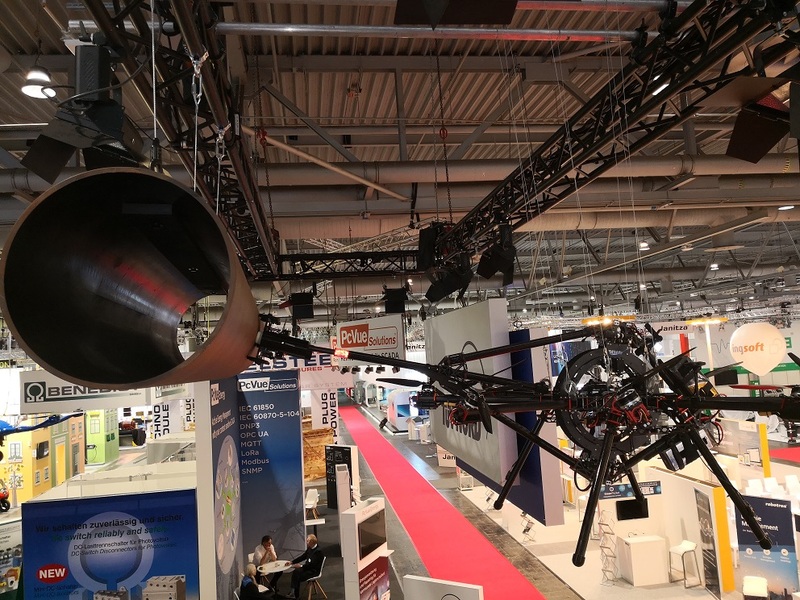 In the most challenging deliverables of the project, the consortium will deliver industrial aerial robots able to perform contact NDT (EC, UT) leveraging the miniaturised, wireless inspection technologies of Sensima Inspection. Together with its partners inspire AG/ETHZ and HESSO-HEPIA, Sensima inspection has been awarded a prestigious grant by the Swiss Space Center, the organisation in charge of the Space activities for the Swiss Government. 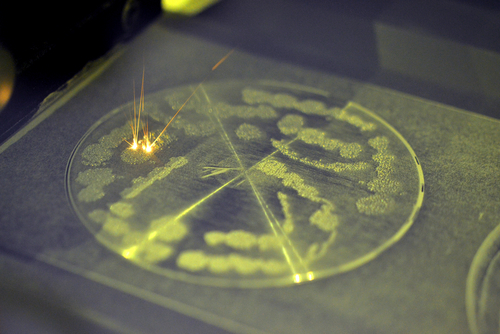 In the frame of the project entitled "Part integrity monitoring during Selective laser melting", the partners will develop innovative process enabling the inline generation of quality documentation during the metal additive manufacturing (AM). The results of this project will be a key component of future AM machines able to produce component with quality standard required for space applications. The success of Sensima underwater NDT tools has raised the attention of asset owners willing to perform the underwater inspection of various infrastructures. 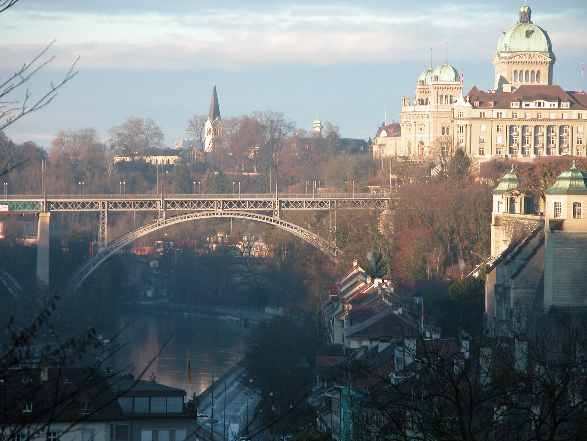 On December 5, 2016, a new UW grid inspection scanner called UW Grid Explorer, has been commissioned for the periodic inspection of the hydropower dam of Verbois in Geneva. 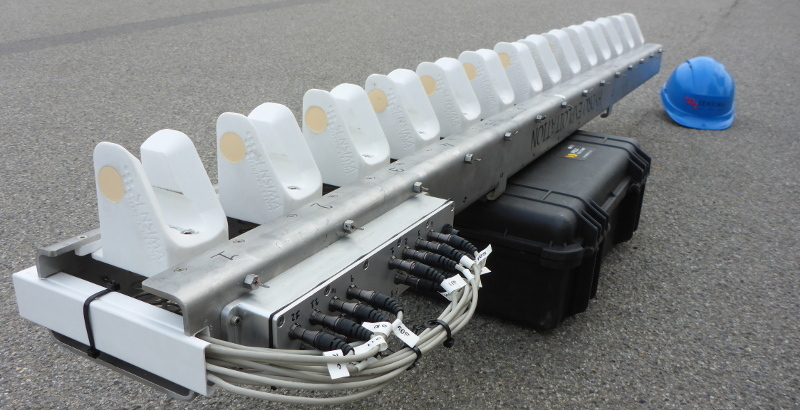 This inspection tool enables the underwater inspection of 14 bars simultaneously at a scanning speed of 0.5m/s. The above picture shows the rack of 14 U-shaped probes and the connection box. The system is powered by the multichannel eddy current unit of Sensima, with the real time display of the signal of 14 Eddy Current channels. Sensima Inspection will present its latest products at the ASNT conference, the largest event for technicians, researchers, and professionals working in the non destructive testing industry. In addition to its Ultra-Portable Eddy Current (UPEC) line of flaw detectors, Sensima Inspection is proud to present its underwater flaw detectors with new features allowing ROV integration. Our product catalogue covers eddy current inspection equipment and monitoring sensors, from array probes to testers as well as low frequency magnetic sensors and electronics, all of which are designed to improve performance, reduce equipment size and weight, and facilitate integration and interfacing with your inspection systems. Pay us a visit at booth 252. 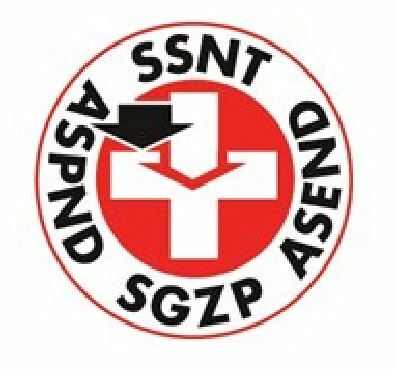 Sensima Inspection is honored to host the 75th meeting of the UT committee of the Swiss society for NDT that will take place in Gland on May 4th, 2016. In addition to their agenda, the participants will exchange with Sensima team on the challenges of the future NDT. Sensima Inspection is pleased to announce the foundation of SEDECT SA, the latest chapter in the story of SENSIMA that started in 2008. SEDECT SA will pursue the development and the commercialisation of innovative metal detectors for security applications. The initial project is conducted in collaboration with Geneva Airport and will lead shortly to the delivery of detection devices to this airport. In the following video, the product and its impact on the passenger control is presented by Geneva Airport. Sensima Inspection has been invited by Institut de Soudure to present its latest crack monitoring solutions. About 120 experts of the maintenance of pipeplines have participated to this technical meeting. The application of the eddy current monitoring solution for Oil & Gas has been presented by Sensima Inspection and discussed with the participants. For the 5th time, Sensima Inspection will present its latest products at the ASNT conference, the largest event for technicians, researchers, and professionals working in the non destructive testing industry. This year, the Ultra-Portable Eddy Current (UPEC) line of flaw detectors, introduced in 2013, is extended to multi-channel instruments. The full line of testers retains its uniqueness in terms of compactness, performance and ease of interfacing with digital mobile devices. We also present our novel and compact 3d EC locator providing real-time scanning capabilities to hand-held probes, which, in addition to being able to produce C-scans with a resolution better than 0.1 mm, can reconstruct the inspected surface in a working volume of about 40 m3 (1000 ft3). Our product catalogue covers eddy current inspection equipment, from array probes to testers as well as low frequency magnetic sensors and electronics, all of which are designed to improve performance, reduce equipment size and weight, and facilitate integration and interfacing with your inspection systems. Pay us a visit at booth 539. Together with its partner Hydro Exploitation, Sensima Inspection has been invited to the Technical Days of the Institut de Soudure, Paris, France to present its latest developments in condition based monitoring. A particular attention was given to automated system operating in underwater environement and to the delivery of the information allowing the asset owner to make decision without complex further information processing. It is widely known that eddy current measurements can provide useful information on the properties of ferrous materials. Modifications of the microstructure and of the dislocations distribution caused by heat treatment or work hardening result in variations of the magnetic domain wall motion, which affect the electromagnetic response of the sample. While the underlying microscopic mechanism relating these quantities is difficult to describe quantitatively, the relation between the electromagnetic response and the microstructure is a very efficient empirical tool to sort parts, both by comparaison with reference batches or by statistical analysis of samples. There is a growing interest for the application of this technique to the quality control (QC) of parts with complex geometries and/or manufactured using exotic techniques such as EDM, SLS, or water jet. Moreover, eddy currents can prove an attractive complementary technology for the detection of subsurface porosity. All these new applications can however not be addressed directly with a standard NDT eddy current instrument. Sensima Inspection recently released QC systems tailored for these applications, the most challenging beeing the detection of near surface porosity in non ferrous components and the QC of work hardening and heat treatment in minute mechanical parts. Customers appreciated differentiating features of Sensima Inspection technology and products such as bespoke sensors optimising the contrast between samples of different properties while enabling reproducible measurements of minute mechanical parts. QC system includes an intuitive software that can be parametrised to generate alarms based on calibration sample sets. Compared to alternative technologies, the eddy current QC can achieve impressive throughput rates, a key advantage both for manual tests and automation lines. 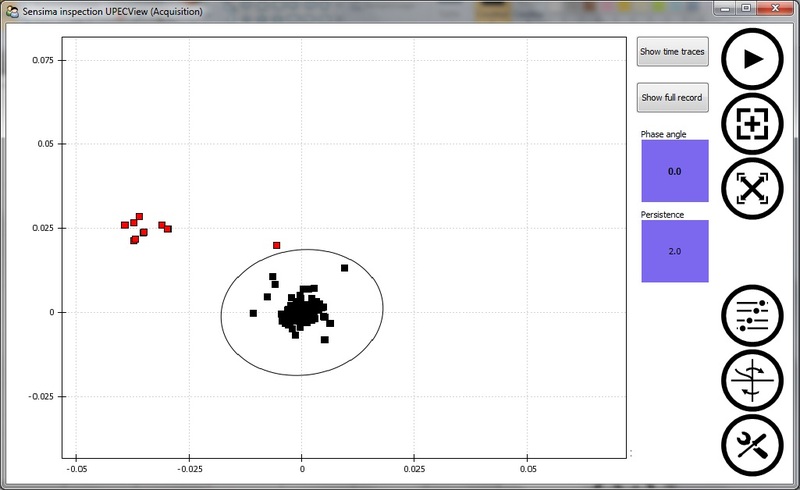 In the following printscreen, the response of a set of 300 parts is plotted in the impedance plane representation, the acceptable samples being located in the ellipse, while the red dots correspond to the samples that are rejected. 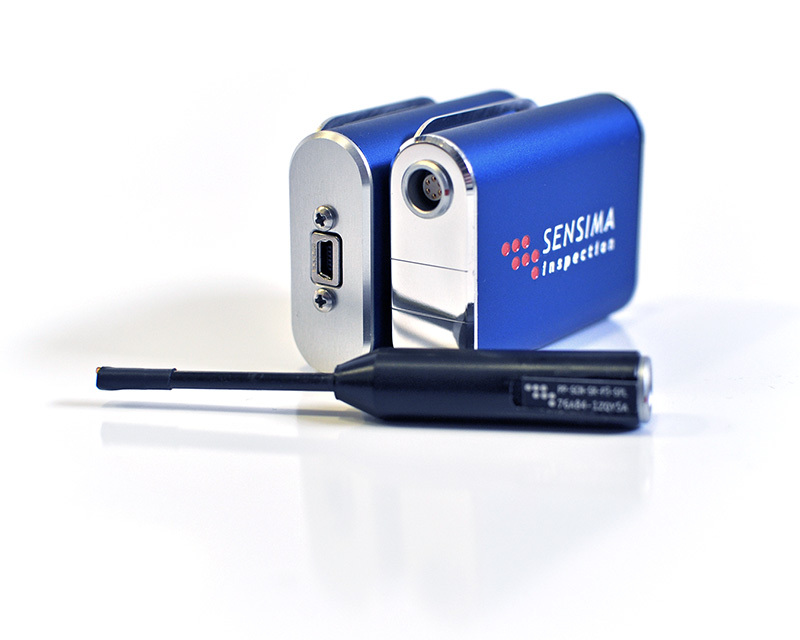 Responding to requests from both private companies and governmental agencies, Sensima Inspection initated 2 years ago the development of a novel crack monitoring sensor for civil engineering and oil and gas applications. The prime target of this sensor is the monitoring of the most important parameters of a crack detected on a metallic part, such as crack tip position, crack depth, and load response. This technology will ensure that a dramatic evolution of the crack occuring before corrective action is completed does not remain unnoticed. Key to the development of the sensor was the capability to produce a miniaturised, multichannel, fully integrated, reliable and cost effective EC system matching the growing demand of the field for "the right sensor at the right place for the right reason". The sensor performance validation phase has been successfully completed in the Steel Structures Laboratory of Prof. Alain Nussbaumer at EPFL opening the route for the first on site pilot project to take place later in Switzerland this year. At the occasion of the ASNT SMT conference, Sensima Inspection will present its latest developments for the monitoring of cracks in metallic civil infrastructures.. The ASNT SMT conference promotes the exchange of information between national and international researchers, practitioners, and infrastructure owners on the application of Nondestructive Evaluation (NDE) and Nondestructive Testing (NDT) technologies for the condition assessment of highway infrastructure. Download abstracts and papers here. Sensima Inspection is happy to celebrate with the underwater NDT community a year of successful utilisation of its UW Eddy Current (UWEC) tester. The most recent project was conducted early this month by the diver company Shape of the World to inspect underwater welds at an offshore location in the Atlantic Ocean. Recent developments to the inspection setup include a full duplex audio connection and simultaneous display of the impedance plane on an UW monitor. 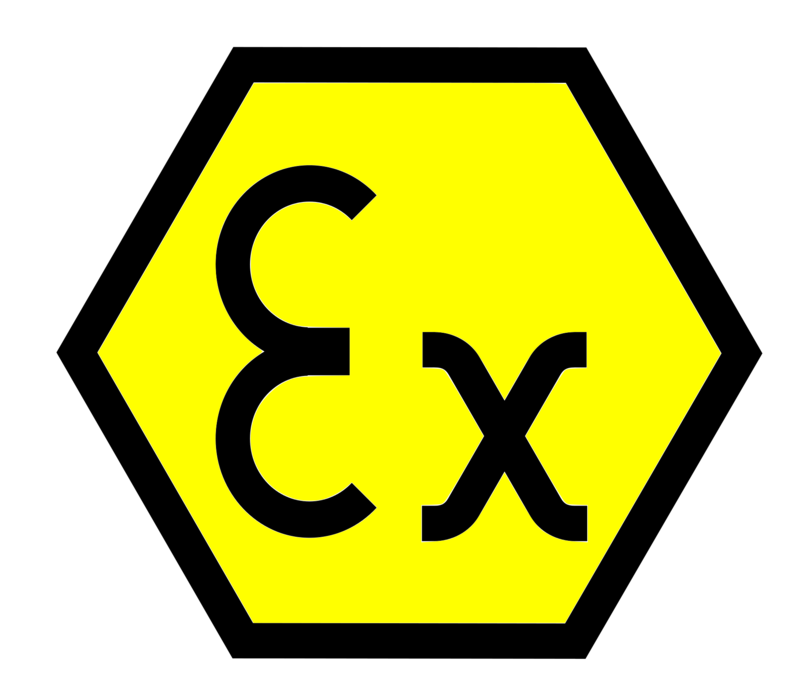 This enables both the diver and the inspector located on the surface to view the same information. In particular, the diver can directly monitor the probe response as displayed by the Sensima "UPECView" software. More details on the UWEC tester in our product page. All in all, a brilliant demonstration that this Sensima equipment can perform a practical application of the BS 1711:2000 standard for UW NDT! This inspection system is aimed at detecting cracks on a grid protecting the turbines intake of a run-of-river power plant. The scanner, which contains 8 U-shaped eddy current probes and the control electronics, is attached to the bucket of the crane that automatically cleans the grid from various materials that may obstruct the intake. A cumulated bar length of 160m is inspected in 1 minute as seen in the above movie. The full grid, corresponding to a total 4.5 km of bars, can therefore be inspected in one day. "It is impressive how this advanced technology could be integrated in an existing cleaning crane. We can therefore run this inspection device with zero interference with the plant operation." said the technical manager of the power plant. The scanner has been jointly developed by Sensima Inspection and Hydro Exploitation for the power plant owner (SIG-Geneva). March 25, 2014: Sensima Inspection awarded ! The Region of Nyon is a dynamic, rapidly growing region located midway between Geneva and Lausanne. 4 years ago, Sensima Inspection decided to relocate its headquarter there to benefit from this outstanding environment and the proximity of high quality suppliers. Today, Sensima Inspection has been awarded the first Innovation Award by the REGIONYON Council for the innovative accomplishments of our company and its potential for growth. The press release is available here. At the occasion of the ASNT tradeshow, Sensima has released the UPEC, its latest eddy current tester. With a software running both under Windows and Android, UPEC is the first eddy current instrument designed for the mobile technologies. Mobile and portable devices are now ubiquitous. Why should an NDT equipment manufacturer impose one to you ? We at Sensima focus on designing the most compact eddy current testers and on developping softwares taking advantage of modern devices. Up to you to decide which portable computer is best suited to your NDT application, large or small display, rugged or not, tablet, laptop or smartphone, Android or Windows. Last month, Sensima team performed the first on-site tests of a new system aimed at mapping penstocks for wall thinning (corrosion) and flaw detection. This project is conducted jointly with Alstom Inspection Robotics and Hydro Exploitation with the support of The Ark Foundation. This unique technology consists of an ROV with advanced navigation capability that is instrumented with ultrasonics and eddy current NDT equipment. The final NDT product, that will be released in September 2013, will enable large scale, cost effective mapping of the penstocks used for example in hydropower plants. The automated reporting functionality will help asset owners make important decisions on maintenance and operation. The Sensima Underwater Eddy Current Tester is released. The compactness and performance of this product allow underwater NDT in optimal conditions. Available in absolute and differential configurations up to 100 bars. Accessories, integration, and customization on request. The Sensima Ultraportable Tester has been integrated on a Buggy together with an eddy current sensor. The system can be used to performed various remotely controlled EC inspection tasks. Developed in collaboration with Alstom Inspection Robotics. Our partner Hydro Exploitation has recently performed an extensive inspection of the underwater grids protecting the intake of a hydro power turbine. Key to this inspection was the Underwater Eddy Current Equipment of Sensima Inspection which was used for the first time in real conditions. The UW Eddy Current tester is a specialized version of the innovative Ultraportable USB tester developed by Sensima Inspection. The unprecedented compactness and performance of this product match the demanding needs of professional underwater NDT companies. "The Eddy Current module is very compact, I could safely keep it on my gear all day long, compared to other equipment that have to be attached to a fixed point, this made my life easier for this inspection which covered quite a distance" said the diver after the inspection. 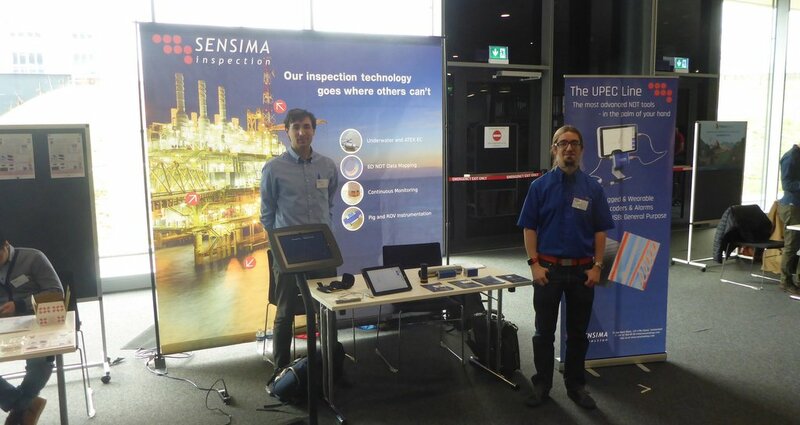 Sensima Inspection is a high tech company founded in 2009 as a spin off of the Swiss Federal Institute of Technology. 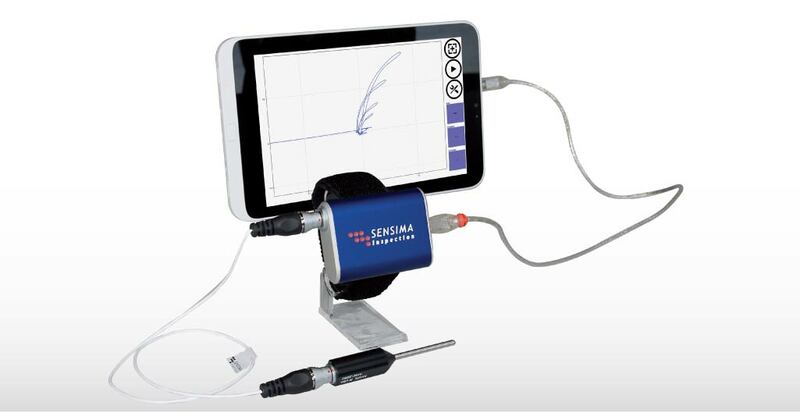 Sensima Inspection develops and markets	advanced electro-magnetic solutions for non destructive testing (NDT) and quality control, with a focus on crack detection, sizing, and monitoring in metallic components. We offer a unique combination of the most advanced technologies including IC design and a recognized expertise in non destructive testing. Our innovative products are designed to improve performance, to reduce equipment size and weight, and to facilitate integration in and interfacing with your inspection systems.